When the Mars 2020 rover lands on the Red Planet in early 2021, it will carry with it a small helicopter, the first human craft to fly on another planet. Until now, Mars has hosted orbiters, landers, and rovers, but no flying machines. The small helicopter will enable scientists to remotely explore regions of the planet’s surface far from its mothership’s landing site, according to NASA. It will be sent to Mars as a technology demonstrator, which means if it doesn’t work, the Mars 2020 mission will still succeed. “NASA has a proud history of firsts,” said NASA Administrator Jim Bridenstine. “The idea of a helicopter flying the skies of another planet is thrilling. The Mars Helicopter holds much promise for our future science, discovery, and exploration missions to Mars.”The Mars Helicopter’s development began in 2013 at NASA’s Jet Propulsion Laboratory (JPL) in California. It’s just under 4 lbs. (1.8 kilograms), and its body is about the size of a softball, NASA officials said in the statement. It will carry solar cells to charge up in the light of the sun and a heating mechanism to endure cold nights on the Red Planet. With its fuselage about the size of a softball, and its twin, counter-rotating blades will be able to bite into the thin Martian atmosphere at almost 3,000 rpm – about 10 times the rate of a helicopter on Earth. “The altitude record for a helicopter flying here on Earth is about 40,000 feet. The atmosphere of Mars is only one percent that of Earth, so when our helicopter is on the Martian surface, it’s already at the Earth equivalent of 100,000 feet up,” said Mimi Aung, Mars Helicopter project manager at JPL. “To make it fly at that low atmospheric density, we had to scrutinise everything, make it as light as possible while being as strong and as powerful as it can possibly be,” Aung said. Aside from the challenge of flight itself on the Red Planet, engineers also had to figure out how the craft would navigate with communications delays of at least a few minutes between Mars and Earth. Engineers solve this problem with the rovers by taking careful pictures of the terrain and then guiding the rover slowly toward its goals, with many stops along the way to reassess any risks. But a helicopter needs faster response times, being more likely to encounter wind patterns and other obstacles that could knock it off course. And of course, if the rover ever malfunctions and stops operating, it will still be safely on the ground. The helicopter must have built-in systems to safely land itself if it encounters any errors. Once the rover is on the planet’s surface, a suitable location will be found to deploy the helicopter down from the vehicle and place it onto the ground. 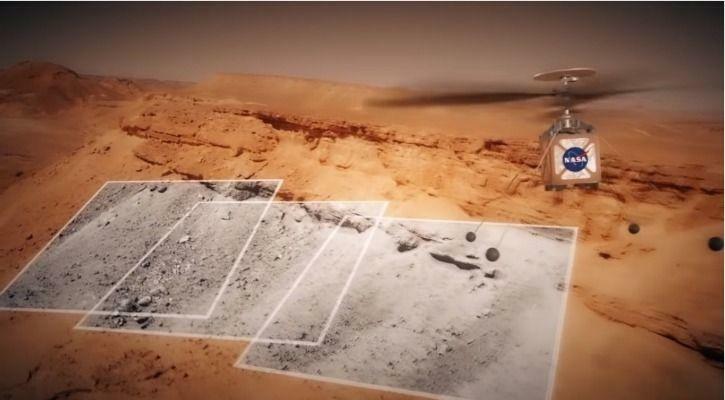 The rover then will be driven away from the helicopter to a safe distance from which it will relay commands. After its batteries are charged and a myriad of tests are performed, controllers on Earth will command the Mars Helicopter to take its first autonomous flight into history. The full 30-day flight test campaign will include up to five flights of incrementally farther flight distances, up to a few hundred metres, and longer durations as long as 90 seconds, over a period.On its first flight, the helicopter will make a short vertical climb to three metres, where it will hover for about 30 seconds. The miniature chopper’s main purpose is simply to prove that remote-operated flight on Mars is possible, and NASA plans to send it on five missions, each a little further than the last. While it flies, it will capture photos using a camera similar to one you’d find on a smartphone. If it works as planned, future missions to Mars could deploy more tiny aircraft, which would allow researchers to explore further beyond the reach of the landers they arrived on.